What is cinema’s preoccupation with desecrated burial sites? How many movies have to be made before this topic has finally run its course? Perhaps Macedonian director Milcho Manchevski is not aware that there is an entire genre of movies devoted to the spirit world diaspora, where souls who have a bone to pick wander the earth haunting those who still use VHS players or have wells hidden in their backyards. That genre is commonly known as J-horror. 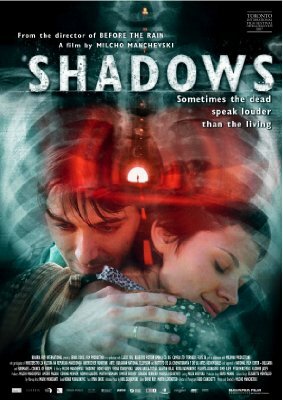 Shadows is Manchevski’s third film, following the well-received “Before the Rain” (1994) and the more recent “Dust” (2001). Exactly what the urge was to tell this particular story is a mystery. The film brings nothing new to a tired movie genre (“The Sixth Sense”, “The Ring”, etc.) except, perhaps, for its beautiful Mediterranean locations and the nakedness of several lovely Macedonian women. Machevski’s camera lingers on the women’s bodies to the point where you feel a little complicit in his salaciousness.